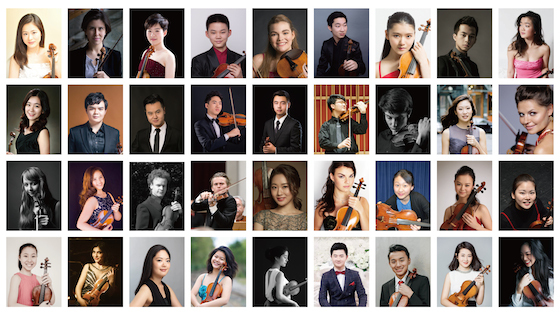 April 8, 2018, 9:45 PM · The 2018 Shanghai Isaac Stern International Violin Competition (SISIVC) has announced 36 quarterfinalists who are invited to participate in its second-ever live competition rounds in Shanghai late this summer. The candidates, from 10 countries, were chosen from 174 applicants from 33 countries. The competition, with a grand prize of $100,000, will begin August 10, with three rounds over the course of three weeks. Second prize will be $50,000 and third prize $25,000, with a prize of $10,000 awarded for the best performance of the Chinese work, Qigang Chen’s "La joie de la souffrance." A $10,000 Isaac Stern Prize also will be awarded to an individual – in any field and from any part of the world – who is deemed to have made an outstanding contribution to the understanding of humanity through music. Winners will be announced Sept. 1. The jury for the SISIVC 2018 will be co-chaired by conductor David Stern, son of Isaac Stern, and Vera Tsu Weiling, who is professor of violin at both Shanghai and Beijing Conservatories. Other members of the jury will include Lina Yu; Siqing Lu; Maxim Vengerov; Augustin Dumay; Zakhar Bron; Dora Schwarzberg; Daniel Heifetz; Weigang Li; Philip Setzer; Glenn Dicterow and Sreten Krstic; Martin Campbell-White and Emmanuel Hondré. Contestants will be required to clarify if there is any immediate family or pupil relationship with any jury member upon arrival. The Shanghai Isaac Stern International Violin Competition was founded in 2015, with the first competition taking place in 2016. It was named after violinist Isaac Stern, whose 1979 visit to China was a great source of hope and inspiration for violinists and musicians in China, following that country's "Cultural Revolution," during which western music had been banned. Winners in the 2016 Shanghai competition included first-prize winner Mayu Kishima of Japan, with Sergei Dogadin of Russia coming in second and Serena Huang of the United States third. This is good to see as there are often questions asked about such relationships; especially in regard to Zakhar Bron. I know nothing against Mr. Bron - who famously taught Vengerov and Repin - but gossip can make things more difficult for the prize winners. In the theatre we say ‘break a leg’ to the actors, so here maybe ‘break a string’ ? April 11, 2018 at 01:21 PM · How many violin competitions are there? I lost count ages ago!